Please join the Board of Trustees and staff for a night to honor dedicated volunteers and generous donors. Guests will have the opportunity to enjoy a delicious meal and a chance to catch up with other MNA members and supporters. John is the Refuge Manager for the Detroit River International Wildlife Refuge. He is a highly regarded Great Lakes scientist and author of Bringing Conservation to Cities. The dinner will feature a special silent auction to benefit MNA’s Environmental Fund! On Friday, October 18, MNA will host the Volunteer and Donor Recognition Dinner at the Kellogg Hotel & Conference Center in East Lansing. 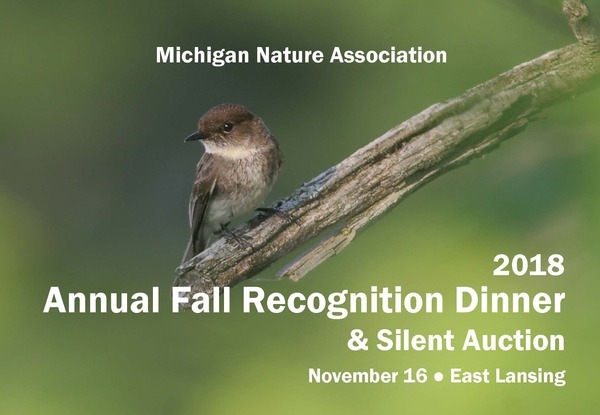 This year’s event includes a special silent auction to benefit MNA’s conservation initiatives! Join us to learn about MNA’s efforts, honor special volunteers, and mingle with fellow MNA supporters. Enjoy a week on Mullet Lake in northern Michigan in a vacation home with three bedrooms, two bathrooms, a field stone fireplace, ping-pong room, deck and dock. This house sleeps up to 10 people and is a beautiful retreat! Enjoy a personal tour of the Chateau Chantal winery, an explanation of the winemaking process, and a personal wine tasting with a wine educator. See stunning views of the Old Mission Peninsula and explore the Old World Inn! Explore Copper Harbor by kayak! This package includes two tickets for a two-and-a-half hour kayak exploration on Lake Superior, surrounding Copper Harbor. The tour includes kayak instruction, all equipment, and a professional guide. Artist Casey Williams uses stone he personally collects from Michigan’s Great Lakes to create beautiful functional stone products. Surrounded by stone from the Great Lakes, this mirror would make a beautiful addition to any room! This copy of Ruin and Recovery: Michigan’s Rise as a Conservation Leader is signed by author Dave Dempsey, named Michigan Author of the Year in 2009. These beautiful sculptures are original designs, hand enameled by highly skilled artisans using traditional tools and techniques. This set of two sculptures is a unique interpretation of nature’s beauty. Download the Auction Preview Guide for a complete list of available items! Purchase your tickets for the Volunteer and Donor Recognition Dinner today! Visit the MNA website or contact Danielle Cooke at 866-223-2231 or dcooke@michigannature.org. Seating is limited, so reserve your spot soon!